Hard copies of a bachelor’s or master’s thesis are to be printed on single-sided A4 sheets of archival-grade paper. Line spacing for all text pages as well as the table of contents is 1.5; however, the line spacing may be adjusted as appropriate for the table of contents. For the list of references and the description page, the line spacing is 1. The default text size for the report is 12 points. The text font must be clear and easy to read. Examples of suitable fonts include, i.a. Avenir Next, Helvetica Neue, Courier, and Georgia. Other fonts may also be used at the writer’s discretion, provided that they meet the aforementioned expectations for readability and legibility. 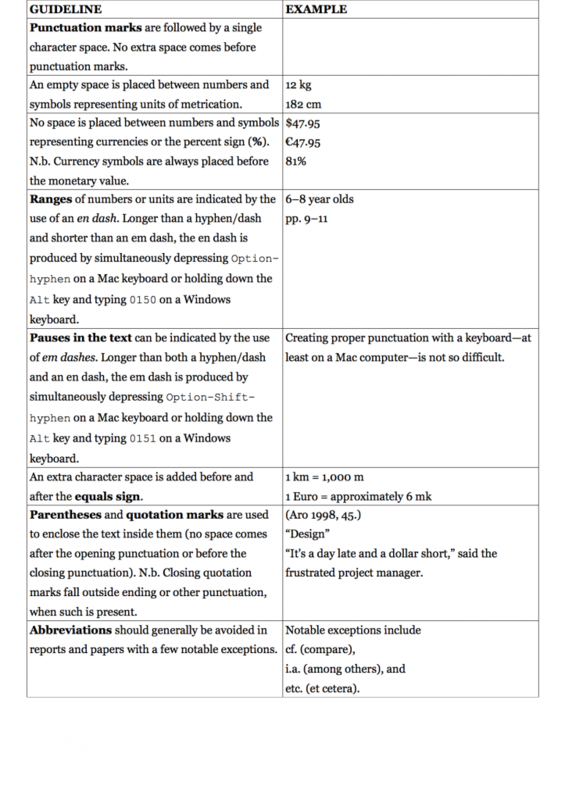 The text size and font for the description page are specified in various instructions and forms contained in the JAMK Study Guide. The specifications for page margins are prescribed with the possible future handling, printing, and binding of the report in mind. The margins are to be set as follows: 4.3 cm for the left side and 2 cm for all others. Paragraph breaks are used, but the body text must not be justified across the page: lines should break naturally, as this lends itself to improved readability. The recommended amount of space after each paragraph is 12 points. When a document’s paragraph settings are configured in this way, there is generally no need to add any space before paragraphs. Page numbering starts with the table of contents (page 1) and continues uninterrupted through the list of references and appendices (the description page does not belong to the range of numbered pages). The text of a thesis is divided into chapters (main chapters and subchapters), based on the contents of the report, for the sake of readability. Run-on paragraphs or the absence of paragraph breaks make for a laborious and difficult reading experience. On the other hand, an overabundance of short paragraphs causes the text to become choppy and disorderly, which might result in the reader being unable to see the connections between isolated ideas and the broader context. As a rule of thumb, only one key point should be treated in a given paragraph. Paragraphs are aligned flush with the left margin: the first line of a paragraph begins from the left margin, and distinction between paragraphs is made by the presence of an amount empty space roughly equal to that of a line of text (approximately 12 points). No indenting is used for new paragraphs. On text pages, small sections of text can be headed with bold-faced titles. Minor headings are written using sentence case capitalisation. They are not numbered and do not appear in the table of contents. Text can be emphasised typographically when there is a desire to stress certain information, for example when an important point is presented for the first time in the text. Important points can be written in bold typeface, and long citations (i.e. over three lines) written in italics, single-spaced and indented (see the Indenting section below). The emphasis of text must be used consistently, but also sparingly and prudently, so that its effect is not compromised. No form of text emphasis may be used for more than one purpose in the same text. A list must comprise linguistically similar items. A list cannot be situated in the text as a standalone paragraph, but rather must always be preceded by an introductory sentence or clause. Likewise a list with no introductory sentence or clause cannot be used to begin a chapter. Upper case letters are followed by a full stop: A., B., C., etc. ; lower case letters are followed by a closing parenthesis: a), b), c), etc. The rules for capitalisation and punctuation of list items follow the basic rules for sentences. If a list item forms a complete sentence, the first word begins with a capital letter and the sentence ends with the appropriate ending punctuation. For lists embedded within a sentence, as in the case of the example above, punctuation is used as appropriate to separate the list items and, finally, to end the sentence. Lengthy direct citations—those of more than three lines—are indented one tab stop (five empty spaces) from the left margin, single-spaced, and italicised. Indented blocks of directly quoted material do not need to be enclosed in quotation marks. Lists, equations, and formulas are also indented one tab stop from the left margin and padded above and below with an amount of empty space roughly equal to one line of text. Formulas short in length may also be embedded within sentences, provided that approximately five extra character spaces are added both before and after them. Before getting too carried away with a writing assignment, it is strongly advised that the page, paragraph, and other style settings of the chosen word processing programme be properly configured. There is, in fact, good cause for putting the technical aspects of writing to use even in the earliest stages of a writing project (see Table 1). Once a report has been written, it should undergo a final review of the style, spelling, grammar, and notation technique.